You’ve heard of Morphine. It’s an opioid painkiller administered by health professionals worldwide every day. If you’ve ever been hurt badly enough to be hospitalized, there’s a good chance you were given Morphine for the pain. Morphine is actually listed as one of the two most important opioid painkillers by the World Health Organization, making it a crucial part of a basic healthcare system. Morphine and other opioid painkillers are involved in 40% of all drug overdoses, and Morphine itself is essentially heroin, just less refined. You may not have heard of Fentanyl. It’s an opioid painkiller as well, used mainly for anesthesia and pain management, and it’s up to 100 times stronger than Morphine. You may have been given Fentanyl prior to a surgery, and it is often used by veterinarians on smaller animals requiring surgery. Fentanyl has also helped produce drugs to alleviate cancer pain. When used properly, it is an effective medicine. Fentanyl patches have been killing children under 2 for over fifteen years, and starting around 2006 there has been a steady rise in the amount of deaths caused by Fentanyl. You likely haven’t heard of Carfentanil, unless you are in the veterinary field and deal with large mammals. Carfentanil is extremely close in chemical makeup to and can be derived from Fentanyl. Similar to Morphine and Fentanyl, it too is an opioid painkiller, primarily marketed as Wildnil, for use as an anesthetic for large animals such as elephants. It’s 100 times stronger than Fentanyl, and is therefore 10,000 times stronger than Morphine, making it “one of the most potent known and the most potent commercially used opioids,” according to the US National Library of Medicine. Carfentanil is never administered to human beings. Due to its limited medical use, the US government only allows an annual production quota of 19 grams. Ingestion of this powerful drug can cause near-automatic respiratory failure, as the entire nervous system slows down to a point where death is imminent. Carfentanil has lately been being mixed into heroin, and bad batches have killed tens of thousands of people. An amount the size of a poppy seed can be lethal. Heroin use in America is an overwhelming epidemic. It’s estimated that 900,000 Americans use heroin, and it’s a fact that heroin abuse rates have skyrocketed in the past decade. 2014 set a new record for heroin overdose deaths at 10,574. Every day in the news there are sad stories of heroin running rampant and killing young people. Carfentanil plays a major role in this current heroin-caused death spree. Drug dealers are lacing heroin with Carfentanil all across the country and even in Canada. Those who use the laced heroin are overdosing in huge numbers. In fact, no compiled data exists yet for how many people have died in total from Carfentanil-laced heroin, likely because of how quickly this is all happening. In order to see the scope of the problem, individual episodes must be examined. July of this year marked the essential start of the Carfentanil epidemic. Since then, strings of fatal overdoses have been reported all over North America, and continue to be reported this month. These deaths are predominantly occurring from Carfentanil-laced heroin, but the deadly effects of Carfentanil made international headlines in 2002. Movsar Barayev, a Chechen warlord, held 912 people hostage at the Dubrovska Theater in Moscow, Russia. After a three day holdout, Russian police pumped what was called a sleeping gas into the building, effectively killing Barayev and his 40-person team, but also killing 130 of the hostages. Much controversy surrounded the subsequent investigation. It was discovered, however, that the gas was made mainly of Carfentanil. It was literally used as a chemical weapon. (This implication is further investigated below). Now, in America, fourteen years later, Carfentanil is again making headlines. In early July, Ohio police seized large amounts of heroin which was laced with Carfentanil. Apparently some had gotten distributed already. By the end of the month, the city of Akron alone saw 141 Carfentanil-laced heroin overdoses, ten percent of them fatal. Columbus saw ten fatal overdoses(apr link) from the concoction in just a nine-hour period. Last month, over 200 Cincinnati residents died this way in just two weeks’ time. The state has recently been strengthening its police force and creating anti-heroin coalitions. Hamilton County coroner Dr. Sammarco told the New York Times, “We’d never seen it before. I’m really worried about this.” Another quote that drives the point home of just how bad it is in Ohio comes from Akron Police Chief Jim Nice: “Most of the deaths from heroin overdoses are coming from too much Fentanyl being cut into that.” The Fentanyl he speaks of is oftentimes Carfentanil, which remember is the 100x stronger version. In early August, a report from officials in Philadelphia said users of Carfentanil-laced heroin are “dropping like flies.” John Libonati, coroner for Mercer County, is reportedly “desperate to get that information out to the public.” Up until August, there had been 10 Carfentanil-related deaths in the county. During the first week of August there were four more. Regardless, the number of accidental overdose deaths in the county is down from last year. Just days ago, Wayne County chief medical examiner Carl Schmidt reported 19 fatal overdoses from Carfentanil-laced heroin. Also, the Michigan Regional Poison Control Center has reported a rise in severe opioid-related toxicity levels among patients. In the past two months, two Oregon residents have overdosed from Carfentanil-laced heroin. Miraculously, both people survived. Dr. Zane Horowitz, medical director of Oregon Poison Center, knows this is not usually the case. “It doesn’t take much. The first time most people use it is the last time they use it,” said the doctor to local news network NWCN. A huge success for Canadian border officials in early August was also a sign of how bad the Carfentanil epidemic has gotten in North America. In Vancouver, an entire kilogram of the stuff was intercepted in the mail by the Canadian Border Services Agency. It was discovered in a package addressed to 24-year-old Calgary native Joshua Wrenn. He faces a charge of importation of a controlled substance. 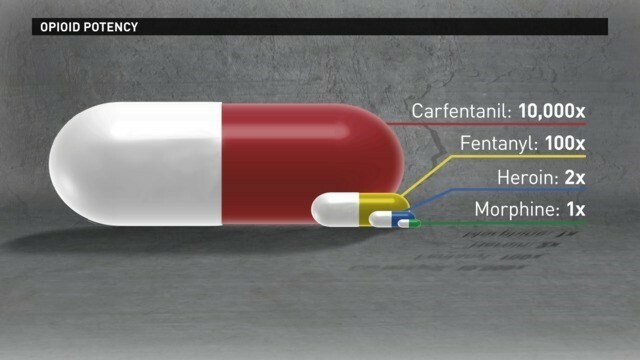 The single kilogram contained enough Carfentanil to kill 50 million people, more than the number of people in all of Canada. Where the Carfentanil came from brings us to an entirely different continent: Asia. CBS recently reported on Chinese businesses that are willing to sell Carfentanil “openly online, for worldwide export, no questions asked,” according to the Associated Press, who investigated these Chinese businesses. Twelve different Chinese vendors were discovered to offer Carfentanil by the kilogram via their websites. China does not list Carfentanil as a controlled substance, and as a nation leads the world in synthetic drug sales. The US has pressed China to outlaw the substance. Nothing has happened yet. The Freedom of Information Act has made it public knowledge that since its creation in 1974, the US, the UK, Russia, Israel, China, India, and the Czech Republic have all researched Carfentanil as a possible chemical weapon. It has since been banned entirely from warfare according to the Chemical Weapons Convention. Former assistant secretary of defense for nuclear, chemical and biological defense programs Andrew Weber said, “It’s a weapon. Companies shouldn’t be just sending it to anybody.” However, if you live in the US, Canada, the UK, France, Germany, Australia or Belgium, one kilogram of death powder goes for $2,750. An email sent in September from a representative of China-based Jilin Tely Import and Export Co. to Associated Press amidst their investigation read, “We can supply Carfentanil… for sure. And it’s one of our hot sales product,” broken English and all. Weber, in response to the ease with which the Associated Press found in ordering Carfentanil from China, said, “Countries that we are concerned about were interested in using it for offensive purposes. We are also concerned that groups like ISIS could order it commercially.” This has some terrifying implications. Fentanyl is a controlled substance in China, along with 18 other related chemical compounds. However, Carfentanil remains uncontrolled. This is rather unfortunate considering the effect China controlling a substance has on the United States. For example, last October, China added Acetylfentanyl, a weaker version of the very-strong Fentanyl, to its controlled substance list. Six months later, Acetylfentanyl overdoses in the US were down by 60%. The problem lies in the “freewheeling chemicals industry” of China, as CBS calls it. Here’s what happens. Vendors that produce these chemicals lie on their customs forms. This enables them to guarantee delivery of Carfentanil to countries where it is illegal. These vendors even go so far as to offer advice to buyers on how to sneak the packages past law enforcement and into their homes. This is some scary stuff. The drug used to immobilize elephants, the largest land mammals on Earth, is being put into heroin all over North America, and most of it is coming from Chinese websites that allow free sale of the stuff, even offering advice on how to sneak it past the cops and the post office. The heroin it’s being put into is killing Americans by the tens of thousands, in all corners of the country. The worst part of all is how undetectable Carfentanil is; heroin addicts are unsuspectingly buying their own deaths. The heroin epidemic is becoming a Carfentanil epidemic, and it needs to stop. This entry was posted in Heroin on October 13, 2016 by Sean Callahan.